The Residences at the Ritz Carlton Hotel Condo real estate development in downtown Vancouver designed by Arthur Erickson, the estimated cost for the completion of the project was roughly five hundred million dollars. This kind of luxury living will be available at The Ritz-Carlton, Vancouver, due for completion in 2011, one of the last remaining major downtown sites in the city. 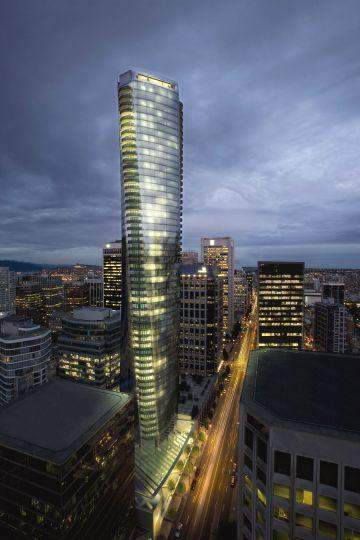 The evocative 60-storey glass tower, a unique curved spine soaring upward, will change Vancouver’s skyline forever. The complex will have 123 luxurious private residences at Ritz-Carlton pre-construction residences on floors 27 to 60. Floors 1 thorugh 26 will house 130 rooms in the Ritz-Carlton Vancouver, the world renowned hotel chain, which operates 63 hotels in 21 countries.